Sikorsky has delivered two S-70i Black Hawk helicopters to the County of Los Angeles at a ceremony in Coatesville, Pennsylvania. The S-70i Black Hawk helicopters will be customized to a Firehawk configuration to meet L.A. County Fire Department's specifications and further protect lives and property 24/7. A Firehawk helicopter performs aerial firefighting and additionally, can plan missions and direct other firefighting aircraft, and provide emergency medical service transport, search and rescue, and logistic support. 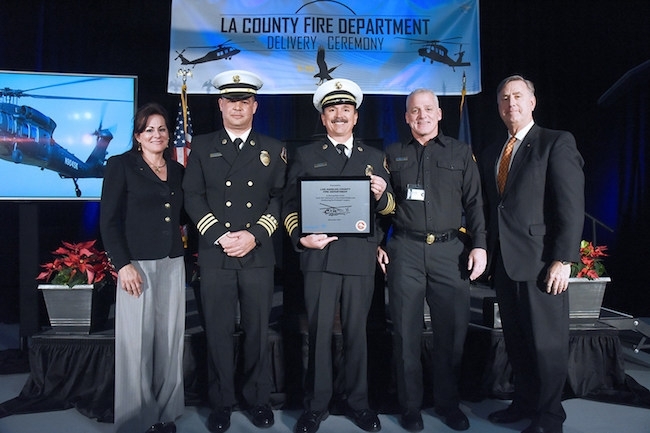 Once modified by a specialist outfitter in 2018 with a 1,000-gallon (3,785-liter) water tank, extended landing gear, single pilot cockpit layout and a medically-equipped interior, the new aircraft will increase to five the L.A. County Fire Department’s fleet of Firehawk multi-role helicopters. Compared to LA County’s three existing S-70A model Firehawk aircraft, the S-70i variant includes wide chord rotor blades for increased payload and maneuverability, enhanced engine power, a stronger airframe, a digital cockpit with flight management system for enhanced situation awareness, and an Integrated Vehicle Health Management System to monitor the aircraft’s operational health. Among improved safety features, the S-70i aircraft includes a terrain and obstacle avoidance system that alerts aircrew to the proximity of potential hazards on the ground. Sikorsky supports the critical mission of the L.A. Country fire department with an all new airframe of the S-70i Black Hawk aircraft, which are available direct from Sikorsky in the U.S. Customers can order aircraft with mission sets and features customized to specific preferences. The L.A. County Fire Department was the first municipal organization to purchase the Firehawk in December 2000.